Katelyn Dunn, senior class president at Bishop Gorman High School, teamed up with two other students at a summer program at Singularity University in Moffett Field, Calif., to tackle one of the world’s greatest problems. Dunn, 17, and her co-founders, Margaux Giles, a student at Stanford University; and Karla Dana, a Long Island University Global College student; came up with Disaster Mesh, an air-deployable, wireless mesh network to create lines of communication during a natural disaster. Instead of leaving the idea for Disaster Mesh at the door when the program concluded last summer, Dunn and her group heard about Verizon Wireless’ Powerful Answers Award, a challenge that encourages entrepreneurs to provide influential technology solutions. 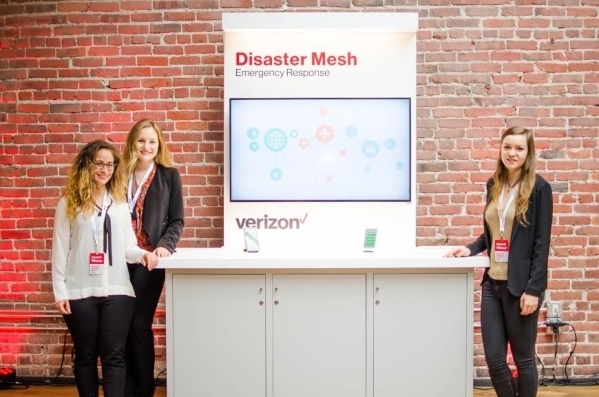 Shortly after applying, the group received word that Verizon Wireless wanted them to pitch their idea for Disaster Mesh alongside 11 other entrepreneurial groups in San Francisco to compete for cash prizes of up to $1 million. On Dec. 9 the group received word that they had won $250,000. In addition to taking the necessary steps to make Disaster Mesh a reality, Dunn said she and her co-founders plan to enter more competitions in the future. Eventually, Dunn said, she’d like to implement a business plan for Disaster Mesh. Though the Disaster Mesh co-founders are spread out across the country, Dunn said that won’t impact their ability to get the product off the ground.